I think I’m not going to correct them. No telling what crap I’d see if they knew the truth. I’m a coffee drinker from way back. In fact, I’ve often wondered if instead of being born in the usual way, I was hatched somewhere from a coffee bean. I know as a toddler my grandparents would give me coffee, with plenty of milk and sugar of course. Over the years my taste in coffee would grow to include the drink of the gods in all its forms: black, black with sugar, black with cream, black with cream and sugar, hot, cold, full-caf, half-caf, decaf, etc. Eventually I moved to a much larger city and was delighted to discover the joys of the coffee house. I was a regular at a local establishment for more than ten years, where I honed my coffee drinking considerably, finally settling on the decaf mocha. 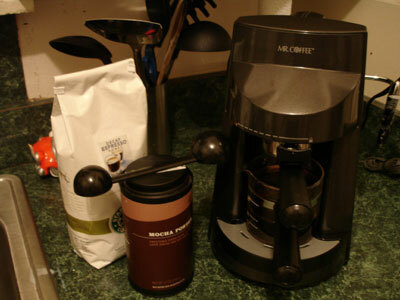 Last Christmas, my husband (then-fiance) gave me an espresso maker as a gift. I freely admit to being a procrastinator. It’s entirely true and it’s the reason I never even tried it out. After all, there’s no way I can make a mocha at home to rival that of Starbucks. Or is there…? Something lately told me to open the box and get that espresso maker out. I know there are lots of people who make espresso at home, so why not me? I can be an amateru barista as well as anyone else. I went to Starbucks (where else?) to buy some decaf espresso roast coffee, which is exactly what they use in my mochas when I order them. While standing in line, I saw a tin of Starbucks mocha powder for sale, which is exactly what they use in my mochas when I order them. I bought that, too. I invited over a friend and her 13-year-old daughter, read the instructions and attempted my first at-home espresso. While my first attempt at attaching the filter holder failed, while my first attempt at frothing milk was mediocre at best, and while my first attempt at emptying the filter when horribly awry as I dumped it in the sink, all together the first mocha wasn’t too bad. (If you ask the 13-year-old.) Now, just a day and three attempts later–A BREAKTHROUGH!!! MY MOCHA TASTES EXACTLY LIKE THE STARBUCKS MOCHA!! !